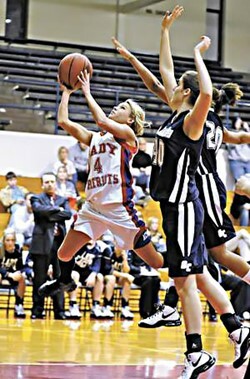 Former Allen County-Scottsville and University of Louisville basketball player Shelby Harper will be on the sidelines this year as part of the AC-S Lady Patriot coaching staff. Harper will serve as an assistant coach, returning to her hometown high school nine years after graduation. Harper graduated from AC-S in 2009 after a stellar five-year career. The 5’4” guard finished high school with 1,627 points---currently fifth on the all-time scorers’ list. Harper is second all-time at AC-S in assists (442) and steals (411). She holds the single-season record for steals (146). Her career-best 38 points in a game ranks fifth best all-time. Harper averaged 19.2 points per game as a senior, helping guide the Lady Patriots to a 21-10 record and into the Region 4 tournament for the first time in eight seasons. After turning down the opportunity to play college ball on scholarship at several smaller NCAA or NAIA colleges, Harper elected to walk-on at the University of Louisville. In her first season for the Lady Cards, Harper worked her way up the depth chart and into the Louisville starting line-up. Harper started 17 games, averaged 3.8 points per game, and dished out 61 assists. Harper earned a scholarship and would play in 92 additional games while at the University of Louisville. In her 2013 senior season, the Lady Cards posted a 29-9 record and finished the season as the NCAA National Runner-Up. Harper admits that coming back to the game to coach will be a learning experience. However, she is excited to contribute. Harper played for coaches Garry DeWitt and Brad Bonds while in high school and under coach Jeff Waltz in college. She believes that the lessons learned from playing under the trio and as part of successful programs at both the high school and college level will also benefit a Lady Patriot program in transition. Once the season starts, Harper will not only assist with the varsity but coach at the freshman or junior varsity level. She admits her preference will be to up the tempo offensively. The search for a head girls basketball coach continues. High school and District officials have spoken with several applicants but have been unable to select a replacement for coach Brad Bonds---who stepped aside in May to become the coach for the boys basketball program at AC-S. The drawback in selecting a head coach has been that few teaching positions have become available in the District, hence, making it difficult to find an applicant who can also fill an available classroom position. If a head coach isn’t hired to fill a teacher slot, officials will repost the position in August or September. This will also allow any educator or former coach who retired from education this summer to apply. Under Kentucky education retirement laws, retirees must not have any contact with a school district in the 90 days after their retirement. AC-S officials remain confident that a head coach will be in place October 15, the day that practice can officially start for the basketball season. Until a new head coach is selected, Harper will oversee open gym and/or pre-season conditioning. The search also continues for another assistant that can join the Lady Patriots on the bench. School officials will also assist Harper during the time as well. AC-S is expected to return seniors Sarah Sutton, Mason Towery, and Jaylee Woods. Sutton averaged 18.6 points and 7.7 rebounds last year. Ironically, Sutton will start the 2018-19 season 10 points behind Harper on the all-time AC-S scoring list. Towery added 13.5 points and 5.8 rebounds while Woods contributed 3.7 points before an ACL injury sidelined her for the year in December. The Lady Patriots finished the 2017-18 season with an 18-12 record.